In the design of the VIP-centre, opened in early 2008, Concrete decided to combine the growing globalisation and generic development of airports, as they came forth as most important for the purpose of the project. Contemporary Dutch product designers exclusively designed objects used in the interior. “When you visit the VIP-centre you should get to know the typical Dutch mentality: our sense of humour and satire, our efficiency and even our economical practicality”, says the Concrete team. Crossing from one entrance to the other, visitors walk through three connecting lounges. 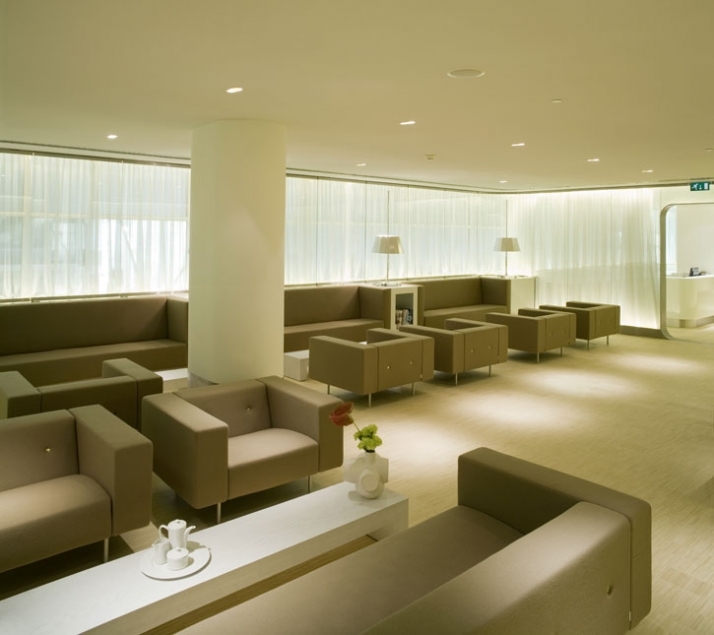 These three lounges form the VIP-centre, surrounded by the other smaller lounges. 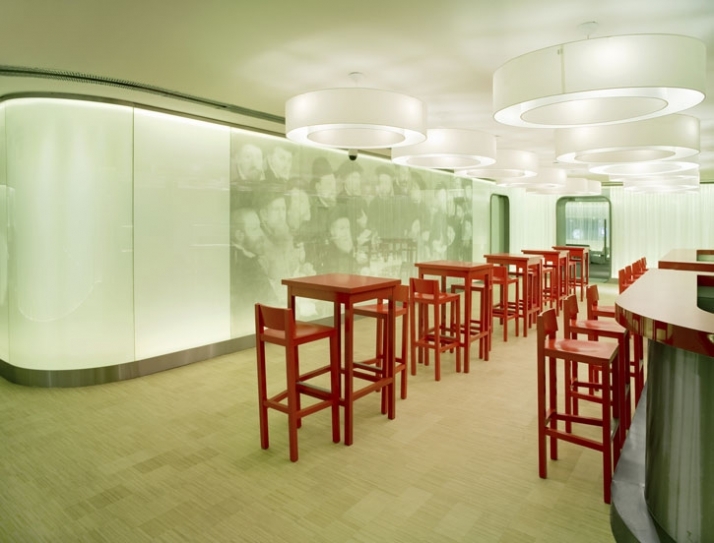 In addition to the three central lounges the total VIP-centre exists of four other large lounges and five smaller rooms. Reception: 80 m2 The VIP-experience starts here. A wide hall leads to a smaller passage, like a funnel. The passage accommodates large wardrobe cabinets and a reception desk. VIP-lounge 1: 115 m2 This is the first part of the three connected lounges and designed to handle more crowd. 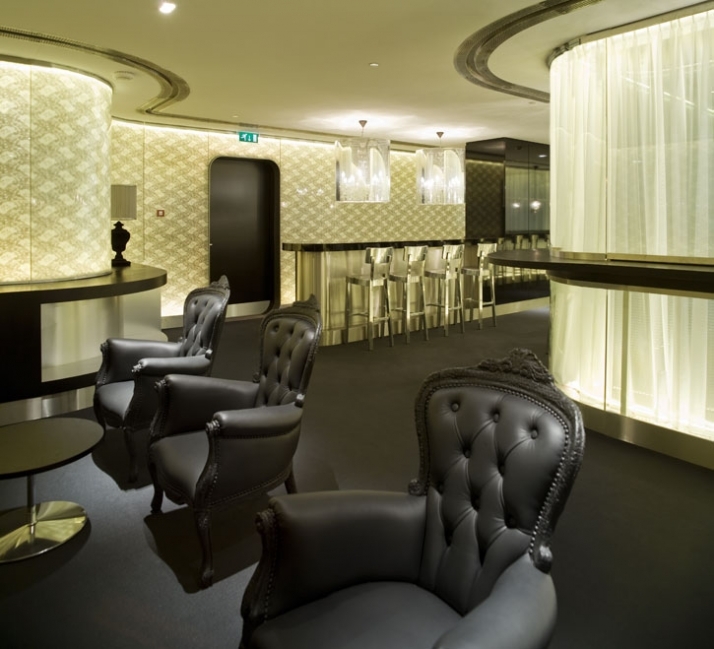 A 10 m couch in front of the facade is surrounded by Marcel Wanders fauteuils. An other part of the lounge gives place to a "news-area": a reading table, and cabinet, made from scrap wood, designed by Piet Hein Eek are placed on a specially designed scrap wood floor. 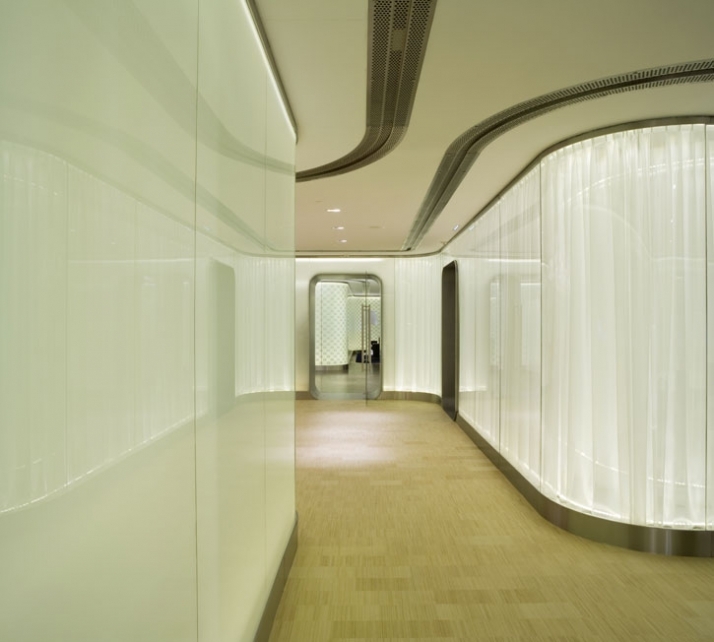 A large flat screen is integrated in one of the glass walls. The floor is finished with side-pressed bamboo and the ceiling with white acoustic plaster. VIP-lounge 2: 90 m2 This area is the heart of the VIP-centre and is crossed by each visitor on its way to one of the entrances. The lounge contains a large red bar and red bar-tables (AVL, by Atelier van Lieshout), a place where visitors can have a drink together with their company or alone. To comfort the lone traveller, the glass is covered with a 6 by 2.6 m interpretation of the painting “18 members of an Amsterdam Rifle Club having a meal” by Dirck Barendsz, 1566. VIP-lounge 3: 80 m2 The third part of the three lounges is closest to airport and assumed to be the most quiet one. Lose round carpets with comfortable chairs (Libelle, by René Holten) create small intimate sitting area's where visitors can read, work or relax. Royal Lounge: 110 m2 This lounge is specifically designed for our Royal Queen and the Royal family. High-gloss smoked oak is placed in a herringbone structure like floors in the Royal Palace would be. Two large Royal blue carpets create two similar sitting areas with in each area two large "Poldersofas" by Hella Jongerius, for this occasion especially finished with different Royal blue fabrics. 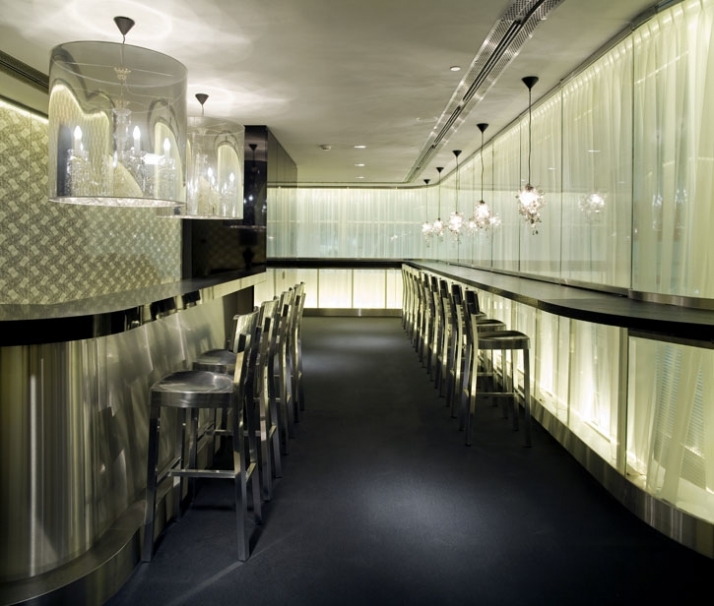 The glass walls are covered with a pattern of the Royal Dutch Arms. A big cabinet (Paper Cabinet, by Studio Job) is placed to give the lounge a home-like feeling. The cabinet is filled with typical Dutch board games and even framed family portraits of the Royal Family. Company Lounge: 90 m2 The Company Lounge is designed for business people. The chairs and couches are designed by Gerrit Rietveld and finished in tones of warm and cool grey. The loose chairs and couches leave the possibility to change the set-up according to different use. A large fixed table surrounded by 12 Gispen chairs can be used for meetings or lunches. Reception Lounge: 100 m2 The reception Lounge will be used by different companies. To avoid the conflict of unmatching corporate colours, the main colour of this lounge is black. The lounge will be used by large groups and contains a bar and a large sitting area. The used furniture can be described as new antique: Smoke Chair by Maarten Baas, Kaipo lamp by Edward van Vliet, Light Shade Shade by Jurgen Bey and a great number of lampshades by Tord Boontje. Pressroom: 100 m2 The Pressroom is the only large lounge without daylight and glass walls. This space is imagined to be a typical Dutch landscape. The floor covering is a carpet printed with an aerial photograph of a green polder landscape nearby Schiphol Airport. The ceiling is provided with a light-clouded sky, which, off course, couldn’t be lacking an airplane. Black office chairs (AVL Office Chair by Atelier van Lieshout) are placed on the landscape carpet in 4 straight rows. Every chair is, for this occasion, specially provided with writing boards. The design of the black, loose office chairs is translated to the back and fifth row into an 8 meter long couch: the “penalty-bench” for latecomers. As a special humoristic Dutch touch is one of the Atelier van Lieshout office chairs produced in a black-and-white cow skin. VIP Room3: ca. 30 m2 Small living room like areas that can be used by small groups. Provided with a large desk and an office chair (AVL Office Chair by Atelier van Lieshout) and small sitting areas of fauteuils and couches (Mare by René Holten).